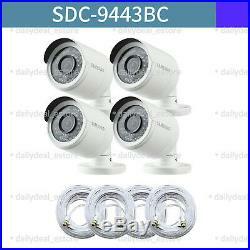 Samsung SDC-9443BC 1080p HD Camera NEW OTHER. 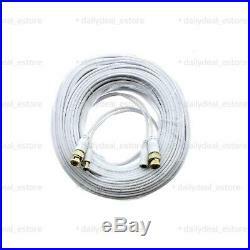 Comes with 4 x SDC-9443BC 1080p HD Camera unit, 4 x 60ft BNC DC cable. 1080p Full HD IP66 Rated Weather Resistant Outdoor Cameras. True Day & Night with ICR for Perfect Color Reproduction. Wide Angle Camera Lens (105°). Night vision up to 82ft (25m). Compatible with all SDH Models: SDH-C75100, SDH-C74040, SDH-B73040, SDH-B73045, SDH-B74041, SDH-B74081. Not Compatible with previous HD systems such as SDH-C5100 & DH-B3040 or any SD systems. For your home or business, Samsung’s security system that is both dependable and affordable. Everything you need to setup and get started is included in the box. Simple to set up and even easier to use, you can monitor your business or home anytime from anywhere around the world so you will always know what is going on. Anytime/Anywhere Viewing with Free iPOLis. With any Samsung’s DVR Security Systems, you always know whats going on from anywhere in the world. Beyond conventional viewing on your computer or laptop monitor, Samsung introduces its free iPOLis app to bring surveillance video right to your iOS or Android devices. In addition, Samsung’s central management software, Smart Viewer®, allows you to oversee multiple systems, in various locations across the globe, from one mobile device. Event & Tampering Notification. Bringing your safety to the forefront, Samsung empowers you to respond instantly to unexpected events, view real-time activity and review stored recordings. Clear, Vivid High Definition Quality. Samsung security systems are known for their high quality recordings. The SDC-9443BC captures video with 1080p HD resolution for a clear, crisp picture. Also these cameras can provide brighter colors and more details with wide field of view. While other cameras constrict your view, Samsung’s 105° Wide Angle lens expands your recording coverage without compromising quality. True Day & Night/Night Vision. The SDC-9443BC camera is night vision capable and can detect and show objects as far as 82 feet even in complete darkness. Each camera also equipped with IR cut filter for best daytime image quality. The systems Privacy Masking feature allows you to block up to four areas within each cameras field of view. This advantage lets you tailor your monitoring to fit your specific needs and eliminate motion detection and false notifications in areas that are not significant to your security or safety. It also plays a part in economizing video storage space. Rest assured that they have been tested to withstand dust, wind and rain. Imaging Device / Effective Pixels. 2M CMOS (1/2.7) / 1920(H) x 1080(V). Progressive, 30fps (NTSC) / 25 fps (PAL). Internal /0Lux (IR LED on). 1CH BNC, Maximum Transmission Length: 180ft. 60ft (18.3m) included. Focal Length / Max. 3.6mm / F2.1. Angular Field of View. D:105°/H:88°/V:46°. Shutter Mode / Gain Control. Auto (Rolling shutter) / Auto. White Balance / Digital Noise Reduction. Auto (1,800°K 10,500°K) / 3D DNR. Flickerless / Day & Night. Auto / Tru Day/Night with ICR. 82ft(Total Darkness)/130ft(Ambient Lighting). Operating Temperature / Humidity. 10°C +50°C (+14°F +122°F) / Less than 90% RH. Input Voltage / Power Consumption. 12V DC / 4W(IR LEDS ON). Dimensions (WxHxD) / Weight. Ø68x149mm (2.68” x 5.87”) / 0.32kg. There will be no exceptions! Items that are damaged or abused by the consumer – Items that are missing accessories, such as remote controls, cameras, cords, or cables – Etched or otherwise personalized items. The item “Lot of 4 Samsung SDC-9443BC for SDH-B74041 & SDH-B74081 New Other” is in sale since Tuesday, June 12, 2018. This item is in the category “Consumer Electronics\Surveillance & Smart Home Electronics\Home Surveillance\Security Cameras”. The seller is “dailydeal_estore” and is located in Ridgefield, New Jersey. This item can be shipped to United States.